History of Driving and the introduction of the UK driving licence. A Potted History of Driving, and the UK Driving Licence. The History of Driving and the UK Driving Licence. We've started with the invention of motorised road vehicles. At that time there was no such thing as a driving licence. The development of the motor car, and the rapid increase over the years in the volume of vehicles on Britain's roads, resulted in the necessity for some means by which the government could ensure that safety prevailed. This 'History of Driving' starts before the driving licence was devised and follows the development of roads, cars and licences over the last 120 years or so. Read on to get an idea of how it all happened. The invention of the motor car really began in the mid-late 18th century with the invention of small, passenger-carrying steam-powered road vehicles. Due to the size and power of these vehicles a 'Red Flag Act' was introduced in 1865, whereby it was compulsory for two people to operate and power the vehicle, while a third walked in front waving a red flag to warn other road users of its presence. Germany's Karl Benz has, for the most part, been credited as the inventor of the first real, 'proper', motor car that was specifically designed to be operated by a sole driver on public highways. His car, invented in 1885-86, was a three-wheeled vehicle, with no windows, that ran on petrol. The mid-1880's to the mid-1890's witnessed the development of numerous four-wheeled, petrol-powered road cars, and in 1896 'The Red Flag Act' was abolished and 'The Light Locomotives on the Highways Act' (The Emancipation Act) was introduced, stipulating an upper speed limit of 12mph for motorised road vehicles. Cars were on Britain's roads! The first motor car race took place in 1895. Front wheel drive appeared in 1897, the honeycombed radiator in 1898, and front suspension in 1899. The Grand Prix was established in 1901 and was held in France, (although the first actual built-for-purpose race track was located at Brooklands in Surrey, built in 1907). In 1903 the 'Motor Car Act' was introduced in the UK. The Act required all motor car owners to register their vehicles with their local county borough council and to display their registration at all times. It also made the driving licence compulsory. The licence was fabric-bound and similar in style to today's passports. It could be bought at local council office for 5 shillings; no test of driving competency was required. However, the 1903 Motor Act also introduced a penalty for reckless driving. The car continued to develop rapidly over the next ten years and began to look more like the modern car, with headlights, windscreens, rubber tyres with pressure gauges, number plates and coil ignition, all by about 1908. Henry Ford's 'Model T' was developed in America in 1909, and by 1913 he was manufacturing factory produced cars. Between 1909 and 1913 four-wheel brakes, the electric starter and four-wheel steering for off-road vehicles had been introduced, with mechanical wipers being developed in 1916. Hydraulic wheel brakes appeared in 1921 and by 1922 Henry Ford had built one million cars. General Motors came to Britain in 1925. The first British Grand Prix was held at Brooklands in 1926 and the first Monaco Grand Prix was raced in the street in 1929. Between 1922 and 1929 world land speed records increased from 133mph to 231mph. It is estimated that, by the mid-1890's, there were approximately 15 motor cars on the Britain's roads. By 1900 there were about 800 cars. By 1930, this had dramatically increased to approximately one million cars on the roads of Britain, and by 1934 there were 1.5 million. In 1930 age restrictions were applied to driving, and a driving test for disabled drivers was introduced. Compulsory motor vehicle insurance was also introduced. In 1931 the first edition of 'The Highway Code' was introduced, and the Morris Minor retailed at £100 (equivalent to £3,342 in 2009). 1933 saw the introduction of both synchromesh gearboxes and semaphore arm direction indicators. In 1934 the 'Road Traffic Act (1934)' introduced a 30mph speed limit within built-up areas to Britains roads. In April 1934 it was announced that driving was soon to be regulated by the introduction of a driving test in order to ensure that each licence holder had safe driving skills. It was stipulated that, from 1 June 1935, a driving competency test was to be introduced, which required candidates to show competent driving skills before they could obtain a driving licence. This first driving test included some elements that still take place in today's test, such as turning in the road and reversing. From this time, 'L' plates were required to be displayed on cars until the driving competency test was passed. Licences now had to be renewed every three years. Windscreen washers were introduced in 1935 and, by 1936, windscreen wipers had become relatively standard on cars. 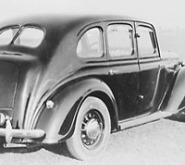 The first diesel car was also developed in 1936. Production of the Volkswagon Beetle began in 1938 following the development and adaptation of a number of prototypes. The number of VW Beetles built since then exceeds 21.5 million. Flashing electric indicators appeared in 1939 and the Jeep was developed, specifically as an army vehicle, in 1940. Driving tests were suspended between 1939 - 1946 as a result of the war, and a year of licencing of wartime provisional licences without testing followed. (Testing was again disbanded for a year in 1956 due to the Suez Crisis). In 1946 the column gear-change was developed, radial tyres followed in 1948 (the same year that the Landrover was introduced) and key-start ignition was developed in 1949. The pass rate for the UK driving test was 50% in 1950. Tubeless tyres appeared in 1953 and both production-line diesel cars and fuel injection followed in 1954. The UK driving test fee doubled to £1 in 1956. The Preston By-pass was built in 1958. This later formed a section of the M6, and therefore was, technically, the first motorway to be built in Britain. The same year, seat-belts were fitted in cars as standard. Driving examiner training was formalised in 1959 and took place in Stanmore Training School. The MOT was introduced as an annual assessment of vehicle roadworthiness in 1960. The E-type Jaguar was launched, retailing at £2,159 in 1962(equivalent to £33,000 in 2009). Hydrolastic suspension was developed in 1962, and the rotary engine in 1963. World land speed records had reached 400mph by 1964. In 1965 the driving test application form was revised and the sight test was changed to include the reading of number plates, with 3 1/8th inch high characters, from a distance of 67 feet. In 1968 the driving test fee increased again from £1 to £1 and 15 shillings. 1969 brought separate licensing groups for different vehicle classes, and stipulated that a provisional licence must be produced at UK driving tests. Four wheel drive and anti-lock breaks were introduced on production line cars in 1966, electronic fuel injection in 1968 and were followed by turbo-charge in 1973. Driving test applications rose by 20% in 1972, and a further 15% in 1973, which resulted in a massive backlog of tests. The 'energy crisis' of 1973 caused a reduction in the purchase of large cars and a change in the car market, with many more medium and small vehicles being both produced, and bought. In 1975 arm signals no longer had to be demonstrated in UK driving tests, and the formal training of Driving Examiners moved to Cardlington. Newly-recruited examiners began to undergo a four week training course in 1976. Audi introduced the Quattro in 1980, which was the first mass-produced car to have permanent four-wheel drive fitted. The wearing of seat-belts became compulsory in 1983. In 1988, the 'Road Traffic Act (1988)' was implemented and guided how driving tests were to be conducted, and the world's fastest production car, the McLaren F1, was launched, with the ability to reach a speed of 240mph. The Driving Standards Agency (DSA) was created in 1990, and examiners began to give feedback and guidance at the end of driving tests. The 'Road Traffic Act (New Drivers) 1995' was passed into law, affecting all new drivers who passed their driving test on or after 1 June 1997. This Act stipulated that new drivers, once they had passed their test, were to be under probation for a period of two years. During this probationary period their driving licence would be revoked if they accumulated 6 or more penalty points on their licence. This Act required the revoked licence holder to then re-apply for a provisional licence (that would be endorsed with the relevant points) and to resit both the theory and practical driving tests. In 1995 newly-qualified drivers were introduced to the Pass Plus scheme, a course of lessons aimed to assist new drivers to gain extra driving experience (such as motorway driving, night driving and driving on country roads) in an attempt to reduce the risk of accidents involving newly-qualified-drivers. Questions on The Highway Code were removed from the UK driving test and replaced by a written theory test in July 1996. In 1997 learners were required to produce photographic ID before they were permitted to sit both the driving theory test, and the practical driving test. For people who failed their driving test, a minimum waiting period of 10 days between driving tests was introduced in September 1997. In May 1999, the practical driving test was changed - the length of the test was extended; 16 or more driving faults resulted in a fail; and the emergency stop manouevre was randomised. In 2000 the touch screen was introduced to the driving theory test. An online booking system was developed to allow learners to book their driving theory test over the internet in December 2001. A hazard perception element was included in the driving theory test in November 2002, and vehicle safety questions, in the form of 'Show Me, Tell Me', were introduced at the beginning of the practical driving test in September 2003. In October 2003 an online booking system was introduced that enabled the practical driving test to be booked over the internet. With a top speed of 253mph, and 0 to 62mph in under 2.5 seconds, the Bugatti Veyron took over as the world's fastest production car in 2005. By 2008, there were 34 million cars on Britain's roads. In November 2008, Lewis Hamilton, at 23 years old, became the youngest ever Formula 1 World Champion. In September 2009 some of the driving theory test questions were adapted slightly to include case study questions within the multiple choice section. As of April 2010, all learner driver's who sat the UK practical driving test were encouraged by the driving examiner to take someone along with them in the back of the car for support during, and after, the test. This person could be a relative, or a friend, or their driving instructor. Driving instructors also began to let learners know that, at any time, they could bring another person along on some, or all, of their driving lessons. They also began to actively encourage parents to be in attendance for, at least some of, the learner's lessons. On 1st June 2010, the driving licence was 75 years old. This page details many of the important, and interesting, landmarks in the history of driving and the UK driving licence. Of course, we can't include everything, but we have included most of the main events that have occurred in the development of cars, and the driving licence, over the last 120 years, or so. It's not the only history of driving that there is. For us, it was a matter of selecting relevant information that helped us to make sense of how the car and the driving licence became what we know today. It's the putting it all together in a chronological format that makes it 'A History of Driving'. But there's more to the UK system of driving and licensing than what's here - check out our other sections to see how other areas, like road safety and the Highway Code, have contributed to the history of driving in different ways. We hope you've found this potted 'History of Driving, and the UK Driving Licence' interesting. But what happens today is tomorrow's history - so visit again. On another day, there might be more to 'The History of Driving' than there is today!